The landscape of process modeling has evolved as have the best practices. The smartest companies are using decision modeling in combination with process modeling. The principle reason is that decisions and processes are discovered and managed in separate, yet, interrelated ways. 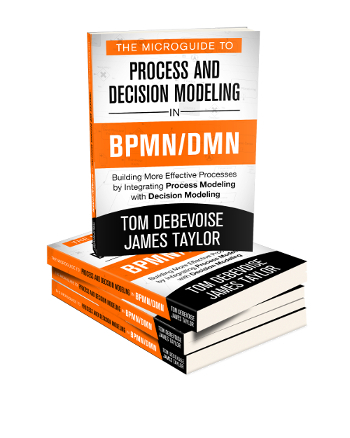 Decision Model and Notation (DMN) is an evolution of Business Process Model and Notation (BPMN) 2.0 into an even more powerful and capable tool set. Streamlined processes – By eliminating unnecessary gateways and scripting activities, the addition of Decision Modeling to Process Modeling streamlines the process. Focused Discovery – The teams that own the decision are often different than the process stakeholders and separate models better engage them. Improved visibility and flexibility – It’s easier to understand and change process behavior by changing the rules that are managed through decisions modeled in DMN. Greater analytic agility – Analytics can generate new rule sets, better decisions, for DMN in a manner that is not possible for BPMN.